Coconut Rain was a scent I couldn’t wait to light up. I am such a huge coconut lover, especially the sweet and tropical scents. The one exception, coconut suntan lotion… that is the only version I am not a fan of. Everything else… bring it!! Mmm!!! That sounds perfect. First impression once I smelled the wax. Loved!! The wax smelled like a fresh and tropical coconut with hints of pineapple and sweet cream. It didn’t smell like a pina colada because I swear I also smelled a hint of sweet floral in the mix as well. That had to be the “cooling summer rain showers” listed in the scent description. I don’t know… whatever it was, I liked it. Colonial Candles large oval jars are generally strongly scented for me, so it felt safe enough to light this candle in my master bedroom. Once the wicks were lit, it took about an hour or so to reach a full melt pool and the aroma… my bedroom smelled like a sweet tropical coconut along with that fresh floral I originally smelled on cold sniff. It was a gorgeous scent. The only downside, the fragrance was a little too subtle for a big open space, so I ended up moving it to a medium size room to see if that made a difference. It did. Once moved to a smaller room, the aroma was amazing. A sweet tropical/floral fragrance perfect for summer. Strength – I would rate this candle a 6 out of 10 in a really large room. 8 in a medium and 10 in a small room. This candle burned perfect. Zero wick issues. Little rings of wax did get left along the glass wall with each new lighting, but it wasn’t a big deal. Aesthetically, you could just see it. 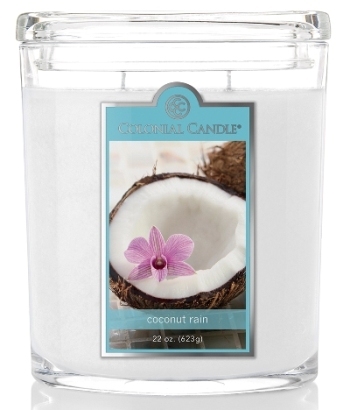 Coconut Rain from Colonial was a fresh tropical aroma worth checking out if you love fresh coconut scents. I loved it… I just wish it would have been a tad stronger. Which brings me to strength – should you give this scent a whirl, try burning it in a medium size room to start out and go from there.